For the Standard Model in Cosmology, see the article on the Big Bang. The Standard Model of particle physics is a theory that describes three of the four known fundamental interactions between the elementary particles that make up all matter. It is a quantum field theory developed between 1970 and 1973, and it is consistent with both quantum mechanics and special relativity. 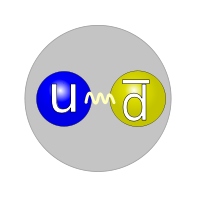 Quark structure of a proton. Quark structure of a neutron. Quark structure of a positive pion. In the Standard Model, the physical world is composed of a set of four "fundamental particles" that are each a unified entity of wave and particle—the wave-particle duality of quantum physics. The wave tells the particle what to do over time, while the interactions of the particle tells the wave how to develop and resonate. The particle aspect is point-like even at scales thousands of times smaller than the size of protons. These wave/particles are classified in the following way: The most fundamental division is that of boson and fermion. Fermions and bosons are distinguished by their quantum spin and the type of quantum probability statistics they obey: Fermi-Dirac probability or Bose-Einstein probability, neither of which is like classical probability. (This is a rough illustration of the difference: 1. The probability of two classical coins coming up the same side—HH or TT—is 50 percent. 2. For two boson coins, the probability of such a pair is 100 percent. 3. For two fermion coins, the probability of a pair is exactly 0 percent, it is forbidden, and one will always get HT.) Fermions are said to have quantum spin-½, giving them the odd property of having to be rotated 720° in order to get back to where they started. (A familiar example of this sort of behavior is the Moebius Strip.) Bosons have quantum spin-1, and take the usual 360° to rotate back to where they started. A lepton is a fermion that does not experience the strong interaction of coupling with the bosons called gluons. The quarks, fermions that can couple with gluons, are confined into composite structures such as the proton or pion (collectively the hadrons. The fermions that ignore gluons are called leptons. The fermions come in pairs in three generations. Everyday matter is composed of the first generation: Two leptons (electron and electron-neutrino), and two quarks, (Up and Down). To date, almost all experimental tests of the three forces described by the Standard Model have agreed with its predictions. However, the Standard Model falls short of being a complete theory of fundamental interactions, primarily because of its lack of inclusion of gravity, the fourth known fundamental interaction, but also because of the large number of numerical parameters (such as masses and coupling constants) that must be put "by hand" into the theory (rather than being derived from first principles). In physics, the dynamics of both matter and energy in nature is presently best understood in terms of the kinematics and interactions of fundamental particles. To date, science has managed to reduce the laws which seem to govern the behavior and interaction of all types of matter and energy scientists are aware of, to a small core of fundamental laws and theories. A major goal of physics is to find the "common ground" that would unite all of these into one integrated model of everything, in which all the other laws known would be special cases, and from which the behavior of all matter and energy can be derived (ideally from first principles). Within this, the Standard Model is a grouping of two major theories—quantum electroweak and quantum chromodynamics—which provides an internally consistent theory describing interactions between all experimentally observed particles. Technically, quantum field theory provides the mathematical framework for the Standard Model. The Standard Model describes each type of particle in terms of a mathematical field. For ease of description, the Standard Model can be divided into three parts—covering particles of matter, force mediating particles, and the Higgs boson. The matter particles described by the Standard Model all have an intrinsic property known as "spin," whose value is determined to be 1/2. In Standard Model terms, this means that all matter particles are fermions. For this reason, they follow the Pauli exclusion principle in accordance with the spin-statistics theorem, and it is this which causes their "material" quality. Apart from their antiparticle partners, a total of twelve different types of matter particles are known and accounted for by the Standard Model. Six of these are classified as quarks (up, down, strange, charm, top, and bottom), and the other six as leptons (electron, muon, tau, and their corresponding neutrinos). Matter particles also carry charges which make them susceptible to the fundamental forces, which are in turn mediated as described in the next subsection. Each quark can carry any one of three color charges—red, green, or blue, enabling them to participate in strong interactions. 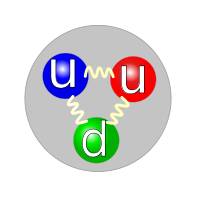 The up-type quarks (up, charm, and top quarks) carry an electric charge of +2/3, and the down-type quarks (down, strange, and bottom) carry an electric charge of –1/3, enabling both types to participate in electromagnetic interactions. Leptons do not carry any color charge—they are color neutral, preventing them from participating in strong interactions. The down-type leptons (the electron, the muon, and the tau lepton) carry an electric charge of –1, enabling them to participate in electromagnetic interactions. Both quarks and leptons carry a handful of flavor charges, including the weak isospin, enabling all particles to interact via the weak nuclear interaction. Pairs from each group (one up-type quark, one down-type quark, a down-type lepton, and its corresponding neutrino) form what is known as a "generation." The corresponding particles between each generation are identical to each other, with the exception of their mass and a property known as their flavor. Summary of interactions between particles described by the Standard Model. Forces in physics are the ways that particles interact and influence each other. At a macro level, for example, the electromagnetic force allows particles to interact with, and via, magnetic fields, and the force of gravitation allows two particles with mass to attract one another in accordance with Newton's Law of Gravitation. The standard model explains such forces as resulting from matter particles exchanging other particles, known as force-mediating particles. When a force-mediating particle is exchanged at a macro level, the effect is equivalent to a force influencing both of them, and the particle is therefore said to have mediated (that is, been the agent of) that force. Force-mediating particles are believed to be the reason why the forces and interactions between particles observed in the laboratory and in the universe exist. The force-mediating particles described by the Standard Model also all have spin (as did matter particles), but in their case, the value of the spin is 1, meaning that all force-mediating particles are bosons. As a result, they do not follow the Pauli Exclusion Principle. The different types of force mediating particles are described below. Photons mediate the electromagnetic force between electrically charged particles. The photon is massless and is well-described by the theory of quantum electrodynamics. The W+, W–, and Z0 gauge bosons mediate the weak nuclear interactions between particles of different flavors (all quarks and leptons). They are massive, with the Z0 being more massive than the . The weak interactions involving the act on exclusively left-handed particles and not the left-handed antiparticles. Furthermore, the carry an electric charge of +1 and –1 and couple to the electromagnetic interactions. The electrically neutral Z0 boson interacts with both left-handed particles and antiparticles. These three gauge bosons along with the photons are grouped together which collectively mediate the electroweak interactions. The eight gluons mediate the strong nuclear interactions between color charged particles (the quarks). Gluons are massless. The eightfold multiplicity of gluons is labeled by a combinations of color and an anticolor charge (that is, Red-anti-Green). (Technically, there are nine such color-anticolor combinations. However there is one color symmetric combination that can be constructed out of a linear superposition of the nine combinations, reducing the count to eight.) Because the gluon has an effective color charge, they can interact among themselves. The gluons and their interactions are described by the theory of quantum chromodynamics. The interactions between all the particles described by the Standard Model are summarized in the illustration immediately above and to the right. The Higgs particle is a massive scalar elementary particle predicted by the Standard Model. It has no intrinsic spin, and thus (like the force-mediating particles) is also classified as a boson. The Higgs boson plays a unique role in the Standard Model, by explaining why the other elementary particles, except the photon and gluon, are massive. In particular, the Higgs boson explains why the photon has no mass, while the W and Z bosons are very heavy. Elementary particle masses, and the differences between electromagnetism (mediated by the photon) and the weak force (mediated by the W and Z bosons), are critical to many aspects of the structure of microscopic (and hence macroscopic) matter. In electroweak theory, the Higgs boson generates the masses of the leptons (electron, muon, and tau) and quarks. As the Higgs boson is massive, it must interact with itself. Because the Higgs boson is a very massive particle and also decays almost immediately when created, only a very high-energy particle accelerator can observe and record it. Experiments to confirm and determine the nature of the Higgs boson using the Large Hadron Collider (LHC) at CERN began in early 2010, and were performed at Fermilab's Tevatron until its closure in late 2011. On July 4, 2012 the two main experiments at the LHC (ATLAS and CMS) both reported independently that they found a new particle with a mass of about 125 Template:Val/unitswithlink (about 133 proton masses, on the order of 10−25 kg), which is "consistent with the Higgs boson." Although it has several properties similar to the predicted "simplest" Higgs, they acknowledged that further work would be needed to conclude that it is indeed the Higgs boson. On March 14, 2013 the Higgs Boson was tentatively confirmed to exist. This table is based in part on data gathered by the Particle Data Group. ** Mass is really a coupling between a left-handed fermion and a right-handed fermion. For example, the mass of an electron is really a coupling between a left-handed electron and a right-handed electron, which is the antiparticle of a left-handed positron. Also, neutrinos show large mixings in their mass coupling, so it's not accurate to talk about neutrino masses in the flavor basis or to suggest a left-handed electron neutrino. 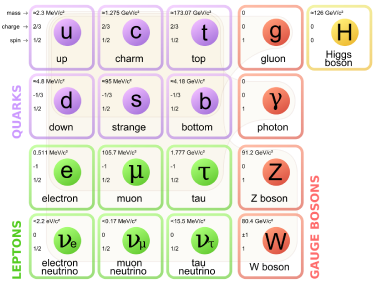 The Standard Model predicted the existence of W and Z bosons, the gluon, the top quark and the charm quark before these particles had been observed. Their predicted properties were experimentally confirmed with good precision. The Large Electron-Positron Collider at CERN tested various predictions about the decay of Z bosons, and found them confirmed. Unsolved problems in physics: Parameters in the Standard Model: What gives rise to the Standard Model of particle physics? Why do its particle masses and coupling constants possess the values we have measured? Why are there three generations of particles in the Standard Model? Why is there more matter than antimatter in the universe? Where does Dark Matter fit into the model? The Standard Model of particle physics has been empirically determined through experiments over the past fifty years. There has been a great deal of both theoretical and experimental research exploring whether the Standard Model could be extended into a complete theory of everything. This area of research is often described by the term "Beyond the Standard Model." There are several facets of this question. For example, one line of inquiry attempts to explore why there are seemingly so many unrelated parameters of the theory—29 in all. Research also focuses on the Hierarchy problem (why the weak scale and Planck scale are so disparate), and attempts to reconcile the emerging Standard Model of Cosmology with the Standard Model of particle physics. Many questions relate to the initial conditions that led to the presently observed Universe. Examples include: Why is there a matter/antimatter asymmetry? Why is the Universe isotropic and homogeneous at large distances? Some claim that the vast majority of possible values for the parameters of the Standard Model are incompatible with the existence of life. According to arguments based on the anthropic principle, the Standard Model has the field content it does and the parameters it has because the universe has to be based upon parameters able to support life, in order for life to emerge able to ask the question. Since life has emerged, the choice of universal parameters is not unrestricted, but is ipso facto limited to being selected from choices of parameters where life could emerge. In theory (goes the anthropic principle), there could be a hundred billion universes where life as it is known today could not emerge, because of having parameters where life was not possible. To a theist, of course, the parameters were set by the Creator and are another sign of His brilliance and sophistication in crafting the Great Design that led to human beings. 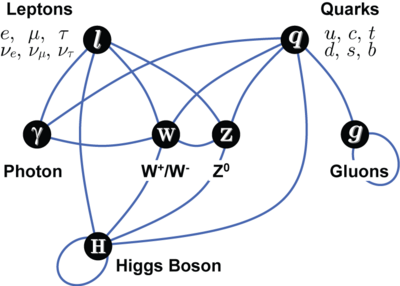 Some physicists argue that if the String theory landscape of possible theories and prior distribution of these theories as well as the probability that any given theory will give rise to life were known, humanity would be able to make a statistical prediction of the parameters of the Standard Model. ↑ Matt Strassler, Higgs Discovery: Is it a Higgs? July 10, 2012. Retrieved October 20, 2015. ↑ New results indicate that new particle is a Higgs boson CERN, March 14, 2013. Retrieved October 20, 2015. ↑ pdg.lbl.gov, Quarks. Retrieved March 28, 2008. ↑ V. Agrawal, S.M. Barr, J.F. Donoghue, D. Seckel, The anthropic principle and the mass scale of the Standard Model. Physical Review. 57:9:5480-5492. Retrieved October 20, 2015. Abers, Ernest S. and Benjamin W. Lee. 1973. Gauge theories. Physics Reports (Elsevier). C9:1-141. Hayato, Y. et al. 1999. Search for Proton Decay through p → νK+ in a Large Water Cherenkov Detector. Phys. Rev. Lett. 83:1529. Novaes, S.F. 2000. Standard Model: An Introduction. Retrieved September 14, 2007. Roy, D.P. 1999. Basic Constituents of Matter and their Interactions—A Progress Report. Retrieved September 14, 2007. The Universe Is A Strange Place, a lecture by Frank Wilczek. Observation of the Top Quark at Fermilab. PDF version of the Standard Model Lagrangian (after electroweak symmetry breaking, with no explicit Higgs boson). PDF, PostScript, and LaTeX version of the Standard Model Lagrangian with explicit Higgs terms.